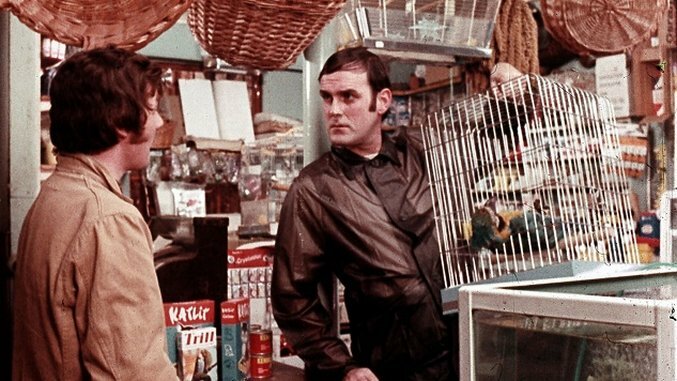 The influence that the collective known as Monty Python has had on modern film and television comedy is something of a given. It’s one of the binding forces of the humor world. The original TV series, which aired on BBC from 1969 to 1974, and the subsequent films that the troupe created (particularly their 1975 masterwork Monty Python and the Holy Grail) have the kind of long tail impact that is still being felt today. It’s a short line that connects their surrealist take on sketch comedy to current mirth makers like Maria Bamford, Eric Andre and the folks behind Key & Peele. There is, however, an alternate universe nightmare scenario that almost came to pass that would have diminished Monty Python’s legacy. In 1971, as the troupe was both preparing for a third season and working to produce a German-language comedy special (Monty Python’s Fliegander Zirkus), writer/performer Terry Jones got a call from someone at the BBC, letting him know that the tapes featuring the first season of their show were set to be erased and re-used. Let’s backtrack a little to explain how this was even possible. At the time, erasing and reusing videotapes was standard practice at the BBC and many of the major TV networks here in America. This was, in part, a cost-cutting measure on the part of these companies, as the price of these cassettes at the time was often prohibitive. And since they were producing fresh content and programs at such a rapid clip, it was deemed necessary to keep recycling through these tapes. There was also the added wrinkle of how Equity, the actor’s union in England, balked at the idea of recording and rebroadcasting TV work. The thinking was that if they performed something live and it was successful enough to warrant being repeated, they would have to be hired again to play the part a second time. Eventually, they agreed to let the BBC re-play programs but only within a strict time frame. Mostly, there wasn’t a mind toward preserving works like this for future historians or fans. If they thought they could re-sell an original program to a new market, they would often record them onto 16mm film and ship the tapes off to another network. This is how the BBC has been able to recover many of the lost Doctor Who episodes, as they’ve turned up in the archives of TV stations in Nigeria, New Zealand and Hong Kong. This is what wound up preserving Monty Python’s Flying Circus in the long run; the BBC was eventually able to sell broadcast rights to PBS, thereby bringing the show to a new audience and blowing the minds of comedy fans in the years before the first commercially produced VHS versions of the series were released. Otherwise, the BBC would have simply used a high-powered magnet to erase the tape and move on. While it may not be a healthy pursuit to dwell on the past, it is pretty startling to learn what has been potentially lost to the ages thanks to these short-sighted actions. A lot of early TV comedy is either missing or incomplete, including a chunk of the pre-Python series At Last The 1948 Show (starring Cleese and Graham Chapman) and Do Not Adjust Your Set (featuring Jones, Michael Palin, Eric Idle, and animations from Terry Gilliam) and much of the Dudley Moore/Peter Cook series Not Only…But Also. Also gone is a lot of variety programs like Scott, the musical showcase for pop singer Scott Walker aired in 1969, and a 1963 drama called Madhouse on Castle Street, which featured a young Bob Dylan who played songs that responded to the action on screen. Sadly we don’t know the identity of the hero who called and tipped off the Pythons about the potential erasure of their first series. In Dead Frog, Jones said it was their editor (presumably, Ray Millichope who worked on the first three seasons of the show) who made the call, but on a Radio 4 interview, this unnamed person is referred to as a “friend in the archive department.” Whomever it is, the worlds of comedy, music and popular culture owe him a great debt as the ripple effects of that one phone call continue to expand out and upset the status quo. Robert Ham is a Portland-based freelance writer and regular contributor to Paste. Follow him on Twitter.